A fisherman from Malaysia caught a mysterious fish in the South China Sea that features a large head, a nose with two sharp spears and sharp spines covering its foot-long body. Fisherman Sapar Mansor from Taman Ceria, Permyjaya was at a loss to identify the weird-looking fish, as were many others. 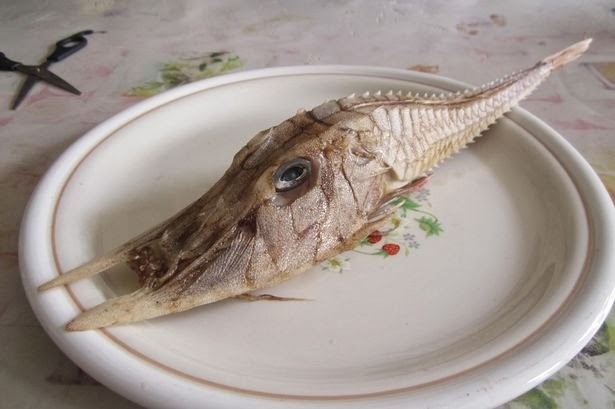 His wife, Siti Kadariah, was surprised to see such a strange fish. The kids started calling the strange creature an "Armour Fish," which is a pretty good guess since it’s actually a Satyrichthys welchi, aka a robust armoured-gurnard. 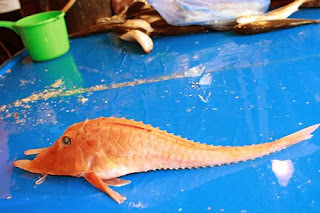 At a fish market in Ormoc City in the Philippines the fish is simply called a Pineapple Fish.